ETTSI’s marketing team saw a need for a low cost incentive with a high perceived value that could be used as a “spiff” of sorts. The promo booklets contain 100 serialized coupons each redeemable for a Vacation Condo Club annual membership which represents a $49.95 value. Businesses who purchase the promo booklet can give these complementary memberships to their valued customers for less than $2 each. ETTSI Incentive Premiums - http://ettsi.com, a licensed and bonded seller of travel for more than 20 years and a pioneer in the travel certificates industry, today announced the release of the Condo Vacation Club Promo Booklet. ETTSI’s marketing team saw a need for a low cost incentive with a high perceived value that could be used as a “spiff” of sorts. 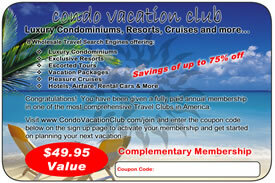 The Condo Vacation Club Promo Booklet fills this need perfectly as it is inexpensive to produce and, unlike other travel certificate programs where there is a substantial cost of fulfillment, the Condo Vacation Club Membership cost is mostly the maintenance of the web site which decreases as a cost per member when more members are enrolled. So, ETTSI has in incentive to dramatically reduce the membership cost to businesses that would be willing to purchase them in a large quantity and use them as sales incentives or as a customer appreciation gift. The promo booklets contain 100 serialized coupons each redeemable for a Vacation Condo Club annual membership which represents a $49.95 value. Businesses who purchase the promo booklet can give these complementary memberships to their valued customers for less than $2 each. Some targeted uses of the promo are to increase appointments and show rates, rewarding customers for referring friends, upselling of increasing the size of the purchase, or simply showing their appreciation to customers for their patronage. For additional information on purchasing these promo booklet for use in your business or for information about ETTSI and their broad range of Travel Certificates, Incentive Premiums and Employee Rewards, you may contact Frank Bertalli at PR(at)ETTSI(dot)com or call 866-224-9650. Distributor inquires welcome. ETTSI (Executive Tour and Travel Services, Inc.) is registered in the states of Florida, California and Nevada as a Seller of Travel. FL#ST22752, CA#ST2065118-40, NV#2006-0132, offering a full service travel agency as well as many travel and cruise packages in the form of travel certificates. For more than 18 years ETTSI has lead the sales incentives industry with unique programs and products always striving to meet the needs and exceed the expectations of the sales organizations they serve. Through the sale of their certificates, ETTSI provides travel accommodations to 1000's of travelers each year garnering them preferred pricing and preferences with airlines, motels, and many other travel related services. Please visit http://www.ETTSI.com ETTSI Incentive Premiums ETTSI Incentive Premiums for more information about the company and its products and services.